Navigate the Details using the map below. 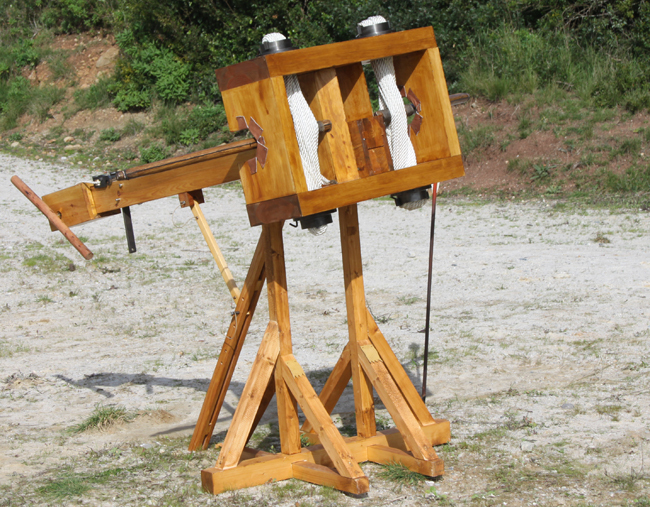 A fully functional real size medieval ballista, an example of torsion powered artillery as used in medieval times. The drawing of the bow-string is made with a winching system and the release with revolving nut trigger (like a medieval crossbow). Pine Wood treated with fungicide and 2 coats of UV and water resistant varnish. Steel St37.2 passivized to prevent rust. Washers made of Naval Brass also to resist corrosion. All steel pins encased in epoxy. - Security features allows disabling the winch or the trigger, or both (so that no-one is tempted to shoot it without permission). Everything is shipped by international carrier in two units: the crossbeam, due to its size, and a wood pallete with the rest (the power frame, bow arms, string, winch, stands, spanner and bolts). The full pack will have a brute weight around 100 kg. These are wonderful machines that can be used as they are, with their good looks and performance and are fun to shoot at affordable prices. If you have more demanding requirements, bellow are some options to beautify or change its performance. In the standard version, each machine is shipped with two rope bundles and instructions for winding them in the frames. It’s an operation that can be made manually as its only time consuming and not technical, and some clients are happy with that. However, CERCO21 crew has experience in setting those spring-ropes and a special apparatus for pre-stretched them really tight. That increases the machine’s performance and so we offer that service as an option. Sometimes bigger is better. By choosing this option, the Medieval ballista will be constructed in a larger scale, designed to fit a van like a Ford Transit. This XL size machine has a D, diameter of the coil springs of 160mm, a dra of 750 kg and weights around 125 kg. It also has bigger shipping costs. Bear in mind that CERCO21 can build in other sizes (even bigger, or smaller), please contact us with your special requests, bear in mind however that in case of huge engines shipping restrictions might apply. As a standard, CERCO21 ballistas are fitted with nylon (twisted) rope for the torsion springs. Nylon has a good Young’s Modulus, it’s impervious to humidity with it's only drawback being degradation through prolonged sun exposure. The historically correct sinew rope or horse-hair rope are not available (we do not favor gutting cats to produce rope). Plant fibber ropes are also an historical alternative (they were used in Western Europe in torsion springs in the Middle Ages), and are widely available. If you wish your machine to have a more appealing historical look, the string ropes can be made in manila, hemp or linen. Because they have a smaller Young’s Modulus this option diminishes the machines performance. Of the alternatives, hemp is by far the better, but some restrictions apply when sending it to some countries. The standard medieval ballista uses a modern gear as part of the winching system, which is totally enclosed inside a wooden box. It’s a safe, reliable and of-the shelf solution, non-intrusive that plays the historical part. A more rugged and crude look can be achieved, with the option of a simple winch with exposed gears. The standard machines are made of pine wood. As an alternative, oak wood or other rare woods can be chosen: that option will make it a heavier but sturdier machine. Also we can try to accommodate a specific colour and hue of varnish or choose as an option to be dark-waxed instead. For those and other options please contact us with your requirements. Beautiful as the machines may be, you may wish to give it a more personalised touch. For instance, if you’re in a reenactment group, you may be interest in engraving the name or coat of arms. There is such a broad scope of possibilities, so contact us with your preferences to learn about the conditions.